Some recent projects show how EBPs have been used in adding value to creative projects. In as well-publicized and carefully tested application, engineered bamboo took center stage at the 2009 Solar Decathlon applied to a residential project with traditional looks and materials as well as some cutting-edge energy technologies. Created by the architecture program at the University of Illinois at Urbana-Champaign, the solution includes 100-year-old barn wood and high-efficiency solar panels arranged with a gable roof profile. “Inside, the newest structural bamboo and optimized windows, insulation, and appliances mean it can be heated with a single hair dryer,” according to the design team. The structural bamboo material was chosen for its renewable characteristics and superior structural performance. Suggesting Midwestern agricultural vernacular, the simple form employs barn wood siding, a barn door-like sliding shade structure, and decking made of reclaimed wood from a grain elevator. Called Gable Home, the project was designed for certification by the U.S. 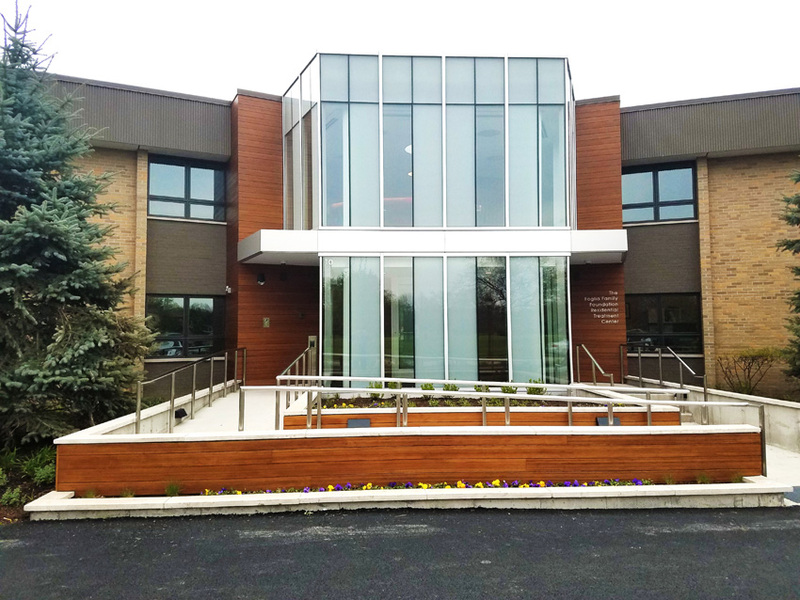 Passive House Institute in Urbana, Illinois, using 90 percent less energy than typical construction. “Laminated bamboo for structural elements is stronger than wood and more rapidly renewable,” according to the team’s DOE page. It also benefits from a “laminated bamboo structure that minimizes thermal bridges.” Other key performance-driven selections include about 12 inches of wall, roof, and floor insulation, a high-efficiency, small-air-volume HVAC system, and a solar array generating about 9.1 kW of DC power. 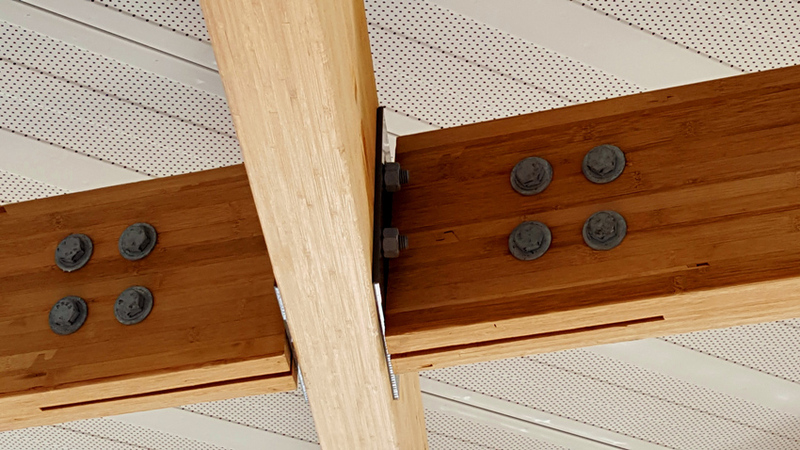 In a very different application, the durability and beauty of structural laminated bamboo are already on display at the new 23,000-square-foot replacement terminal for the Williamson County Regional Airport in Marion, Illinois. Utilizing a pre-engineered hybrid dome of structural steel and engineered bamboo cross beams, the architects of RS&H created a soaring display of exposed structure visible overhead in the terminal’s central court. Structural laminated bamboo is on display at the new 23,000-square-foot replacement terminal for the Williamson County Regional Airport in Marion, Illinois, with its pre-engineered hybrid dome of structural steel and engineered bamboo cross beams, designed by the architecture and engineering firm RS&H. Faculty and masters of architecture students from nearby Southern Illinois University, Carbondale visited the project site to witness the exposed gridwork and framing before the roof assembly was set by the contractor. Sixteen-foot curved EBP beams attaching to 64-foot arcs of curved steel. Created as a showcase of sustainability and innovation, the new terminal marks the first airport in the United States to have an entire roof structure made of structural engineered bamboo, according to the Williamson County Airport officials, when it opened in the fall of 2016. Remarking on the project, the project supplier noted that inherently as a raw material, as a bio-based material, the dimensional bamboo is stronger than timbers on average. In tensile strength, it’s more than two times stronger when you compare it to other timber products relative in size and density. In addition, the roof grid is visible to travelers below in the innovative, sustainable design by RS&H, an integrated architecture and engineering firm. Other projects have expanded the use of engineered bamboo into civic facilities, institutional projects, commercial buildings, and more. The picture above provides another example of EBP’s used in an exterior cladding application. The customer was interested in a natural based product that promotes beauty and warmth and can be used in exterior applications. With EBP’s presenting performance, attractive aesthetic, and stability for interior and exterior applications, the customer received exactly what they were looking for in EBPs. Many architects still visualize the exposed stems and culms of unprocessed bamboo in structures both traditional and modern throughout South Asia, Southeast Asia, and East Asia. Yet, the significant benefits of LVB and other EBPs are changing their perceptions. Engineered bamboo and LVB is becoming shorthand for sustainable, high-performance structural materials that improve building operations, enclosure performance, and overall look of the final project. The use of rapidly renewable bamboo-based engineered materials in green building construction can now include structural components that are typically made with wood, plastic, metal, or concrete. With increased use of engineered bamboo, building projects may qualify for several credits toward LEED certification. The demand to use sustainable building material is becoming more relevant due to the increase in sustainable building practices and the reduction of using petroleum-based building products. LVB is a perfect solution to complement the requirements for sustainable building materials. Another key feature to EBPs, SBPs, and LVB is their unique aesthetic look. These materials are now options to be used in fully exposed applications without the need to “cover it up” with other building materials like dry-wall or paint. The natural beauty of the material can be appreciated by the building owner. Since these products are also available in interior and exterior applications, continuity can easily be achieved and allow architects and designers the availability of using one material throughout an entire project. This benefit not only helps satisfy a visual requirement, but it also can help with the overall cost reduction of not using additional materials to achieve a look the customer is requiring or looking for. The compressive strengths of LVB and other engineered bamboo elements exceed 8,800 psi (parallel to grain), which is greater than most softwoods. The tensile strengths of the products also provide a key advantage over traditional and engineered wood products. Since LVB provides higher dimensional stability over its wood counterparts, this is a key advantage point to architects to design projects with longer spans and know their design will hold true. Lastly, the silica content and arrangement within the material help the bamboo-based products resist termite and other pests.6 Rigorous uniformity and consistency across the supply chains for EBPs adds to these good marks for basic material performance. In summary, EBP, SBP, and LVB products are now being recognized in the architectural and building markets where manufacturers have dedicated their time and resources to enable access to this great building material to architects, engineers, interior designers, product specifiers, building owners, and other decision makers that focus on sustainable building practices. Through continued advancements in technology and engineering practices, EBP, SBP, and LVB products will become better and more available and allow for further expansion of utilizing these products through all facets of design. The architectural and building community can now rely on a sustainable building solution without the worries of deforesting our precious planet and continue the development of design solutions with a sustainable solution. 1Sharma, B., Gatóo, A., Bock, M., and Ramage, M. “Engineered bamboo for structural applications.” Construction and Building Materials, Volume 81, 15 Apr. 2015. Web. 26 March 2016. http://www.sciencedirect.com/science/article/pii/S0950061815001117. 2Modular Building Institute. “Why Build Modular?” Modular Building Institute. Web. 26 March 2016. http://www.modular.org/htmlPage.aspx?name=why_modular. 3Farrelly, David. The Book of Bamboo. Sierra Club Books. ISBN 0-87156-825-X, 1984. Web. 26 March 2016. 4“Bamboo.” Santa Clara University, 2013. Web. 26 March 2016. https://www.scu.edu/media/ethics-center/environmental-ethics/Bamboo.pdf. 5Roach, Mary. “The Bamboo Solution: Tough as steel, sturdier than concrete, full-size in a year.” Discover magazine. 1 June 1996. Retrieved 7 Dec. 2013. Web. 26 March 2016. 6St. Louis Testing Laboratories Inc. “Resistance of Two Bamboo Species Treated with Borates to Formosan Subterranean Termites (Coptotermes Formosanus) in a No-Choice Test.” 2 Dec. 2004. Web. 26 March 2016.